Bathroom cabinets are essential to storage and organization in a bathroom, and they often serve as the support for the bathroom sink. Faceframe cabinets feature doors that overlay the cabinet’s front frame. Vanity cabinets do just this, and often provide two or three drawers and a cupboard for under-sink storage. They may be capped with almost any countertop material from laminate to stone. Tall cabinets and wall cabinets, built just like their kitchen counterparts, can provide generous storage for linens and more. 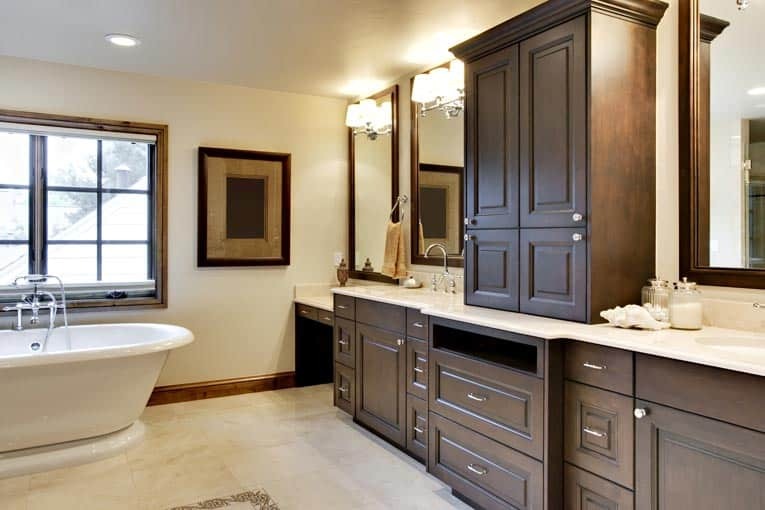 When building a new bathroom or giving an existing bathroom a facelift, it pays to give special attention to the cabinets as early as possible because they often set the stage for the rest of the room’s design and, in many cases, they may take longer to get than other components. When you begin to shop, you’ll find almost endless possibilities, from custom-made, elegant hardwood masterpieces to low-priced bargains that you can buy at the home improvement center and install in a day. And you’ll find that almost any style and size is possible. Frameless cabinet features hidden hinges, maximum storage. Face-frame cabinets are more rigid and affordable to build. Bathroom cabinet may be either built-in—just like kitchen cabinets—or freestanding, like a piece of furniture. 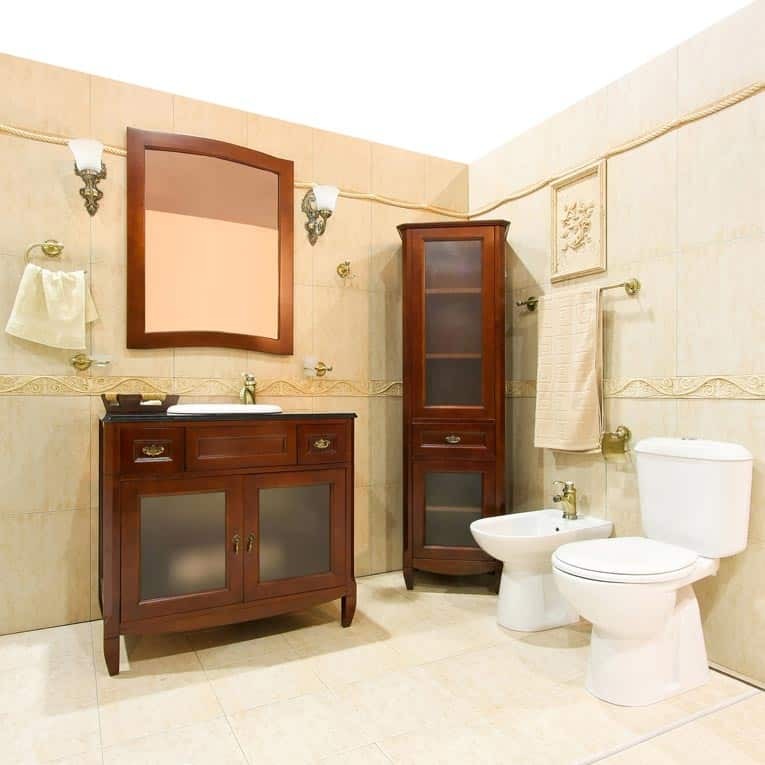 Conventional bathroom vanity cabinets are typically 31 to 33 1/2 inches tall and 18 or 21 inches deep. Widths can range from 24 inches to 60 inches or more. 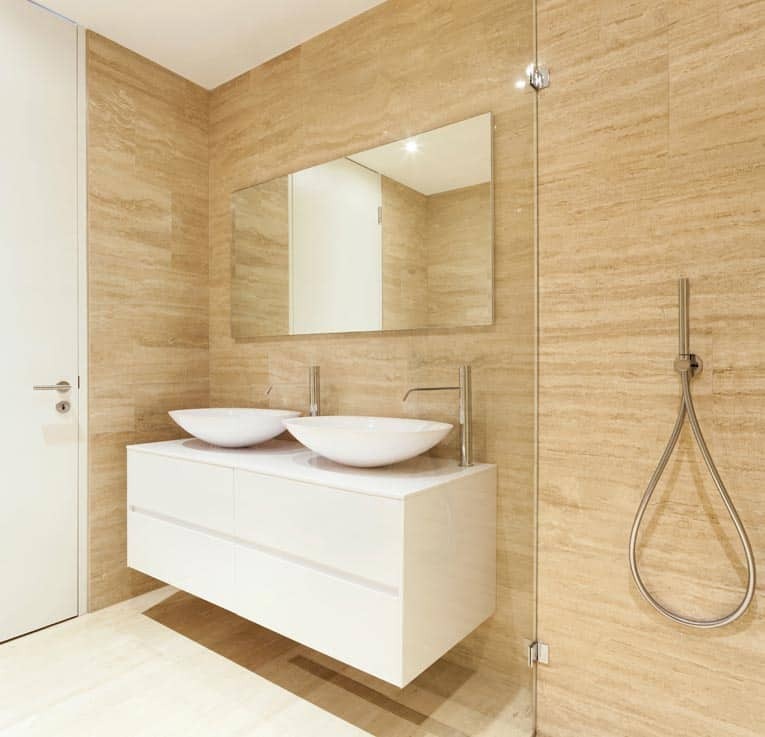 Built-in bathroom cabinets have a construction that is either face frame or frameless (also called “European-style”). Most manufacturers make only one or the other. American manufacturers make primarily the face-frame type, though some also produce frameless models with European styling. As the name implies, a face-frame cabinet has a frame made from 1-by-2 hardwood on the front of the 3/4-inch plywood or particleboard cabinet box. The frame makes the cabinet rigid and provides a strong base for hinges. Doors or draw fronts typically overlay the frame, but they may be flush or offset. On face-frame cabinets, standard offset hinges are partially visible from the front. Because of the added rigidity from the frame, these cabinets don’t have a top panel, and they have only a partial back or a back made of thin material. They have integral bases. The frame can be shaved to fit an irregular wall and makes it possible to use affordable, low-quality materials for cabinet sides. The face frame narrows the opening size for doors and drawers. Frameless European-style cabinets are constructed like boxes, from panels finished on both sides and edged with a simple laminate banding or narrow strip. 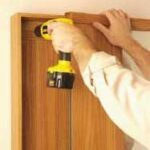 Most types have holes drilled at 32-mm increments vertically along each cabinet side panel; these may be fitted with European hinges, cabinet joinery fittings, drawer slides, shelf pins, and other hardware. European-style frameless bath cabinet has flush doors with hidden hinges. Though most stand on the floor, this cabinet is wall-mounted. Most frameless cabinets have flush doors and hidden hinges. Frameless cabinets usually have a solid top and back and base units and are commonly mounted on top of a separate plinth or toe-kick. Freestanding cabinets generally look like a piece of furniture—a console vanity or small chest of drawers, for example. 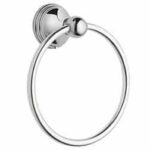 These have grown increasingly popular over recent years as bathrooms have taken on the look of living spaces. Freestanding console cabinets usually have legs, giving them a less bulky feel than conventional cabinetry. Their openness works well in minimal-space bathrooms. Many manufactured console cabinets have shelves, doors, and drawers, though the plumbing beneath the sink interrupts the full use of drawers and shelves, so false fronts are typically used for some drawers or cabinets. 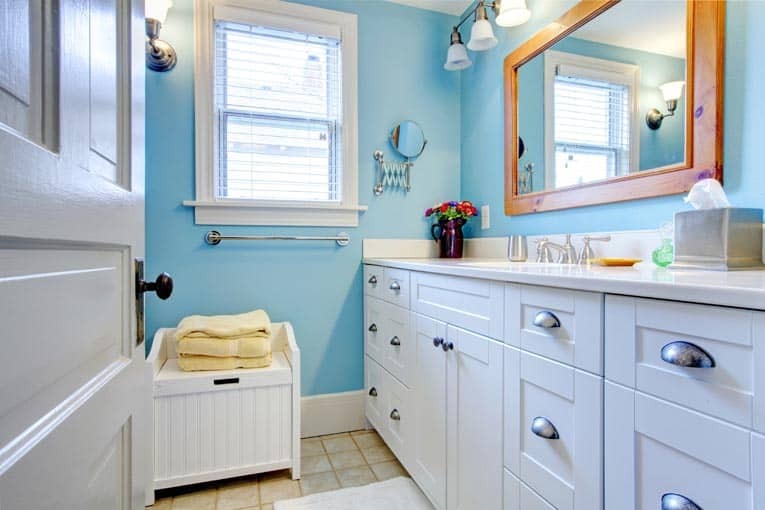 Furniture-style cabinets really make a bathroom feel like a “living space” while creating a strong sense of style. 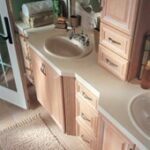 They work especially well with bathroom sinks that sit on top of the counter (rather than flush with the counter), because with a countertop sink, the bowl doesn’t consume cabinet space. In some cases, furniture made for other rooms—such as a bedroom vanity—can be converted for use a bathroom cabinet. 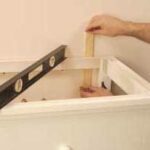 To do this, drawers and shelves must be modified to allow for the sink and plumbing.